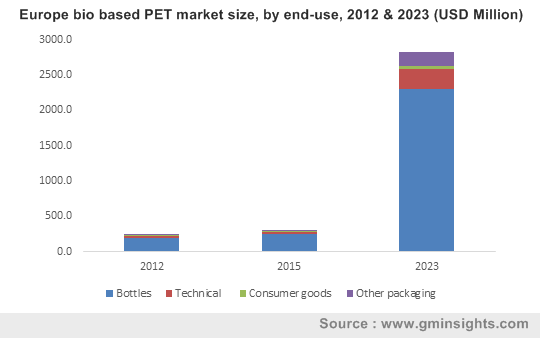 Bio Based Polyethylene Terephthalate (PET) Market size was over USD 1.5 billion in 2015 and expects over 40% growth rate. Increasing awareness among consumers for biomass derived products and stringent government norms by EU to encourage environmental friendly products should drive global bio based PET market size. Global sustainable packaging market size was over USD 150 billion in 2015 and is forecast to surpass USD 250 billion by 2023, with around 4.5% gains. Australia commenced programs including Australian Packaging Covenant (APC) and Packaging Product Stewardship Scheme (PPSS) to promote sustainable packaging. International companies like Coca-Cola, Nike, Procter & Gambler, H.J. Heinz, Ford motor and Hindustan Unilever have contracted a Plant PET Technology Collaborative (PTC), to speed up the use and development of 100% bio based PET usage in apparels, floor carpets, plastic bottles, footwear and technical seat firms. Global biomass obtained chemicals market size was above 4.5 million tons in 2015 and would exceed 8.5 million tons by 2023, growing at over 9.5%. Increasing health awareness among consumers encourages biomass obtained chemicals usage which may positively influence bio based PET market size. Bio based PET is a sugar obtained ethanol product which have 25%-30% bio MEG. Change in emphasis to reduce GHG emission due to rising pollution and health effects can boost bio based polyethylene terephthalate market size. Countries including Australia, Canada and Japan adopted Kyoto protocol and the U.S. and Canada approved Montreal protocol, which can restrict synthetic polyethylene terephthalate usage responsible for GHG emission. These regulatory norms could help develop bio based PET market size over the foreseeable period. Sugarcane is a major raw material bio ethanol production and is also used in MEG manufacturing. Increasing sugar demand for direct human ingestion may obstructs availability of sugarcane as raw material for bio ethanol production. Constructive regulations formed by Brazilian and the U.S. governments for sustainable fuel practice obtained from biomass in vehicles should boost bio ethanol demand. These reasons may limit availability of raw material for MEG manufacturing which can affect bio based PET price trend. Decrease in crude oil price should influence bio PET industry profit as it may turn out to be more expensive than synthetic products. But still, bio based PET industry market forecasts price swing to achieve uniformity with its synthetic counterparts over the estimated period. Polyethylene furanoate (PEF), serves as an alternative to bio PET for its stretchable strength and light weight properties, which may affect industry growth. It requires more staple quantity to manufacture bio PET than bio PEF which hampers the use of PET in bottles for packaging of food & beverages products. Bio based polyethylene terephthalate market size from bottling application, should register over USD 10.5 billion by 2023. Increasing food & beverage consumption in BRICS along with initiatives taken by companies to encourage green technology should boost packaging applications which would drive bio based PET market size. Bio based PET market size from technical application should gain above 35% by 2023. Light weight and high shatter resistance are main characteristics to encourage bio PET market size in manufacturing external and interior technical parts. Bio based polyethylene terephthalate is used in the form of foams, sheets and fabrics for electronics and technical applications. European and U.S. commission including Euro Standards (I, II and III) and CAFE set norms to progress fuel efficiency in vehicles which should drive bio based PET market size. Increase preferences for light weighted materials in technical application to enhance automobile performance should encourage product demand. North America, led by the U.S. bio based PET market size, is foreseen to witness gain at over 40% by 2023. Increasing green packaging demand and new technological innovations to influence regional product demand. APAC, dominated by Japan, India and China bio based PET market size, was above 150 kilo tons in 2015. Rise in alcohol beverages and fizzy soft drinks consumption should drive bio polyethylene terephthalate market size. Latin America, led by Brazil bio based PET market size, would exceed USD 1.5 billion by 2023. LATAM has a benefit of Brazil based sugarcane cultivation, which may promote regional industry growth. Global bio based PET market share is competitive with few industry players. Some companies operating in this industry are Coca-Cola Company, M&G Chemicals, Danone, Toyota Tsusho, Plastipak holdings, Toray Industries, PepsiCo and Teijssin Limited. Companies including Gevo, Virent and Anellotech focuses in developing bio PTA to goal for 100% bio based polyethylene terephthalate production. Toyota made a ten-year contract with Brazilian company, Petrobras for around 380 bio ethanol gallons to certify accessibility of bio based MEG production at Greencol Taiwan subsidiary company. In December 2013, Renmatix and Gevo collaborated for conversion of cellulosic sugar into renewable chemicals including bio obtained MEG and bio based packaging ingredients. Bio based polyethylene terephthalate is a biodegradable material made from purified terephthalic acid (PTA) and monoethylene glycol (MEG) products. There are numerous bioplastics types including polymers made from biomass, polymers extracted from PLA or polylactic acid, bio obtained precursors and polymers produced from PHB and PHAs. These products are used to make beds, furniture, cups, films, carpets, tools, packaging materials, bags and bottles. They discharge around 35-75% less CO2 as compared to earlier plastics during landfills. Vehicle manufacturers are concentrating on applying light weighted parts for confirming comfort, which encourages bio based PET market for lighter weight characteristics. In November 2013, Toyota declared use of bio PET in floor carpets, interior surfaces and seat trims of Sai electric gasoline hybrid car in Japan. AT&T also declared usage of bio based PET in packaging of its device cases, wireless and power accessories. Thailand government permitted to grant a loan program to help bioplastics manufacturers in the country. The program valued at above USD 3 billion and encourages new investments in the bio based PET market. U.S. Government announced the FFBET (Federal Farm Bill Energy Title) promoting central agencies to obtain bioplastic products. In addition, government of Japan also established an aim to produce 20% - 25% of the plastics used would be from bio based products by 2020.